I found this krups espresso coffee machine easy enough to get set up, and once you’ve done the initial prep work and rinsing, it’s also easy to use. Making a good coffee from the machine is a little more complicated, but only in terms of finding the right coffee and the right type of bean grind to get the best results. There’s not much you have to do in the way of assembly. The water container is easy to attach, it’s lightweight and it holds 1. 5 litres, which is more than enough to make an espresso and steam heat some milk. It recommends using ‘tepid water’, which is confusing, as it’s neither hot or cold, so does that mean you heat some water first, or does it just mean natural room temperature water rather than cold water out of a tap?the build of the machine overall is lightweight plastic, but the tools to make the coffee are high quality. The coffee handle and filter is solid and it takes a little bit of force to twist is into the machine. There are one-cup and two-cup espresso filters that are easy to insert and fill with fine ground coffee, and a good measuring scoop with a tamper to press it down. I found my first espresso rather cool and the water ran through too quickly, but heating the cups is recommended and you’ll need to experiment with different grinds to get the best out of the coffee. The pump is manual, so you’ll need to stop the flow yourself when you have got the desired strength of espresso. There has been a real rise in the number of people relying on coffee machines that take individual capsules of coffee. This is incredibly convenient but perhaps doesn’t offer the most environmentally friendly way to make coffee. 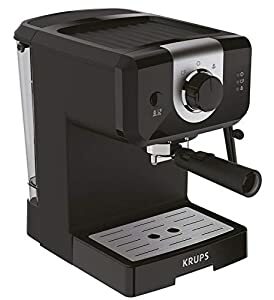 This krups machine is a traditional espresso maker where you place your coffee of choice into the “grouphead” (which is what, i am reliably informed, is the proper name for the metal cup and handle which holds the coffee). This is a really compact little machine, but it packs a lot in to a small size: it takes up to 1 and a half litres of water, which is about three pints, and the machine builds up a great bit of pressure to force the boiling water through the coffee and produce an intense coffee. If you don’t like really strong espresso, you are well catered for, as you can vary the amount of coffee in each cup to make longer, americano-style coffees. The steam nozzle, which you can use to heat and froth milk for you cappuccino, latte and flat whites, works very well and is very easy to wipe clean. The water storage unit is removable and easy to rinse and clean, as well. The coffee that this machine makes is excellent. The high pressure means that water is forced through the coffee quickly, producing a fresh, bright coffee with none of the bitterness that you get if the water trickles through too slowly, which is a problem with some of the capsule-based machines i have tried in the past. On the downside, as the machine is quite small, it isn’t particularly heavy, so it tends to wobble and move when you remove the grouphead and reattach it, so you have to keep one hand on the machine to stop it from toppling. This is a good quality, relatively low-priced coffee making machine. It’s uncomplicated to use, and produces good quality coffee. To make cappucino, you will need to supply your own steel jug for aerating the milk. The machine doesn’t feel that substantial when you get it out of the box, but it is good quality – highly recommended. 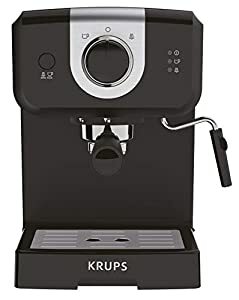 This compact krups manual coffee machine is ideal for drinkers who want a machine that only takes up a small amount of space, doesn’t cost the earth and produces a really nice cup of coffee. The black and chrome finish looks really nice, its compact enough to be stored in the cupboard when not being used, has a decent sized water tank and comes with two different sized filters for making one or two cups, a combined coffee measure/tamper and well written, clear instructions. Its easy to use though like others i do find the filter handle a bit stiff and holding the machine steady whilst fitting/removing it helps. Having used it a number of times now, i’ve got the knack and am finding it easier though it is definitely stiffer than others i’ve used in the past. The wand type steamer is really easy to use and it takes very little effort to produce a good amount of frothy milk in a jugthis machine has consistently provided me with nice espressos with just the right amount of crema, which although partly due to the quality of the coffee is also affected by the machine itself, how much coffee you use and how well you tamp it down. Manual machines do take a bit more effort than automatic or pod type machines, but there’s something quite satisfying about tamping down your coffee and then watching it produce a great espresso. This is a nice, sleek looking machine, that looks more expensive than it is. On first trying it out, it worked well and produced a good cup of black coffee with an excellant crema on the top. The device for frothing milk for cappacino takes a couple of practice goes to get right, but this was the case with our previous machine too. I would say to ignore a couple of the questionable instructions, one to use tepid water in the water storage unit. To take from the hot water system is ill advised as this is not drinking quality and to have to let water in a kettle cool to the right temperature is a bit much to do. Also the instructions to warm up all the accessories before making a cup of coffee, fine again for the barista who is doing this all day, but can’t see the average person doing this?. Cleaning the parts is always a bit of a fiddle faddle with these machines, but no more than any other. On the whole, a good machine, well worth the money and in the end, makes a good cup of coffee, which is the main thing. A good machine that will give you a fair barista experience at home, at good value. Very good pressure to create a nice espresso and with a double filter feature that works very well. The milk frother is a above average and provides a decent heat once you get atuned to it. This krups coffee machine is very easy to use. Straight out of the box there is nothing to assemble & once the tank is filled it takes seconds to make a good coffee. A choice of one cup or two cup dispenser means you can also choose the two cup & have a large size coffee. 15 bar pressure gives professional coffee with a great crema layer. I love this coffee machine, it’s quick, easy, robust & well made. It’s a quality well made coffee machine which looks really smart on the worktop but without the dualit price tag. The first thing to say is that this mini-barista style coffee machine makes a pretty decent espresso if you use level 5 strength ground coffee. Your espresso can then be converted into an americano by adding water, a cappuccino by adding water and steamed/frothed milk or a machiato by just adding steamed/frothed milk. The integral milk steamer works pretty well. The operating instructions are clear: fill the rear reservoir with luke-warm water, switch on, fill the coffee sump, engage the coffee sump with the main body of the machine with a quarter turn of the handle place a small cup below the 2 spouts which dispense the liquid coffee and turn the dial to 10’o’clock. Steaming milk is easy too just put some milk in a small jug, place it under the steam spout and turn the dial to 2’o’clock and away you go. Some negative aspects are: there is nowhere to store the machine’s accoutrements and the drain cover below the dispensing spouts does not clip into position (it just sits there) and repeatedly falls to the floor when the machine is being moved which is a nuisance. Update after 2 weeks of use. I’ve got more adept at using this machine now. Had been putting too much coffee into the sump. Now producing excellent frothy espressos as good as high st coffee house chains. Upped my rating from 3 to 5 stars. Easy to use and makes very good coffee. A few fiddly drawbacks but very impressed nevertheless . The specs are strong on this one. In a relatively compact, small footprint area, you get a really decent pressure through the tampered filter head, and that makes for a nice, strong espresso. Although there isn’t a temp control as such, the unit seems set at a sensible temperature that doesn’t overheat the grounds (and, to be honest, the lack of high precision bells and whistles makes it a breeze to use). It produces a lovely, smooth espresso to enjoy on its own or use as a base for other drinks. What i love about these krups units is that they are perfect for the smaller kitchen space. They’re neither bulky nor heavy, and can be easily put away when not in use, or slid back into a corner or recess on the kitchen counter. We use ours a lot, but it’s good to be able to tidy it off the work surface easily when we need more space for other things. I must admit, i’m not the hugest fan of the black plastic used on these krups machines. It’s partly just a matter of taste, as i think the matt finish could look a bit more premium on a unit this price. But i also don’t think it’s the most durable finish for a premium product casing. This comes out of the box looking gorgeous, its a shiny piano black with lovely silver dials and bar. The size is sensible for a kitchen side too, and the water capacity allows for more than 1 cup. Its fairly easy to use, we took a couple of attempts to get the balance between coffee and milk but its a gorgeous cup.The milk brother is amazing. A true and proper cup of coffee from this machine, makes the “pod” machines seems so unworthy in comparison. For making a cup of black coffee – espresso or to become an americano – i thought this machine required too much effort. The instructions were very long-winded and not very clear. It was difficult to work out exactly how the basket into which the ground coffee goes fits into the machine – i did not want to strain or break anything. On the first few times i tried it out, i got water and coffee grounds everywhereif you like hot frothy milk them the steamer part is excellent – however, i only drink my coffee black. So for me, this machine takes up too much room on my counter top to be useful. This is a good little coffee machine for the price. It lacks the features of maybe some more expensive models like a built in grinder, so you would have to grind your own or get pre-ground coffe. It does come with two different sized cups for the ground beans. It also has a scoop with a temping tool on the bottom. The machine itself is reasonably quiet. It has two options to choose from – milk frother which is rigid but easy to wipe clean, then the coffee setting. The coffee that it makes is nice. We have experimented with various settings to get it just right, although it does come with a decent manual too. This krups coffee machine makes coffee for connoisseurs from ground beans in true ‘barista’ style with full flavour and aroma. All tastes are catered for including espresso, cappuccino, latte etc. With manual settings for flexible control. There is 15 litre water tank, a measuring spoon and a coffee tamper. Water heats up rapidly, and the machine works at 15-bar pressure with steam nozzle for frothing and single or double shot options. Operation is straightforward – and resultant coffee is 5-star. I also hate the rip-off prices cafes charge. The solution, make coffee at home. In the past 5-8 years we’ve used the nespresso coffee system. It has been good but is actually quite expensive and the coffee can be ever so hit and miss. This coffee machine removes the ambiguity and lets you take control and get it right, ever time. It has a water tank, an on and off button, a coffee or steam mode and that’s it. It comes with two coffee filters – a large and small so you don’t waste your coffee is you’re only making a quick espresso and a measuring spoon / coffee tamper. You put your coffee into the filter on the handle, attach it to the machine (which requires a fair bit of force) and then simply select coffee and you are good to go (it takes about 2 minutes to heat up initially).